Trim and cut lamb into medium-sized pieces. Peel, quarter, and core quinces. Cut quinces into medium-sized pieces. Peel and finely dice onion. Heat olive oil and butter in a tagine or large saucepan and sear meat and onions for approx. 2 min. Add quince, ginger, turmeric, cinnamon, and honey and let simmer for approx. 15 – 20 min., stirring occasionally. Season to taste with salt, pepper, and lime juice. Serve with sesame seeds and some yogurt, if desired. 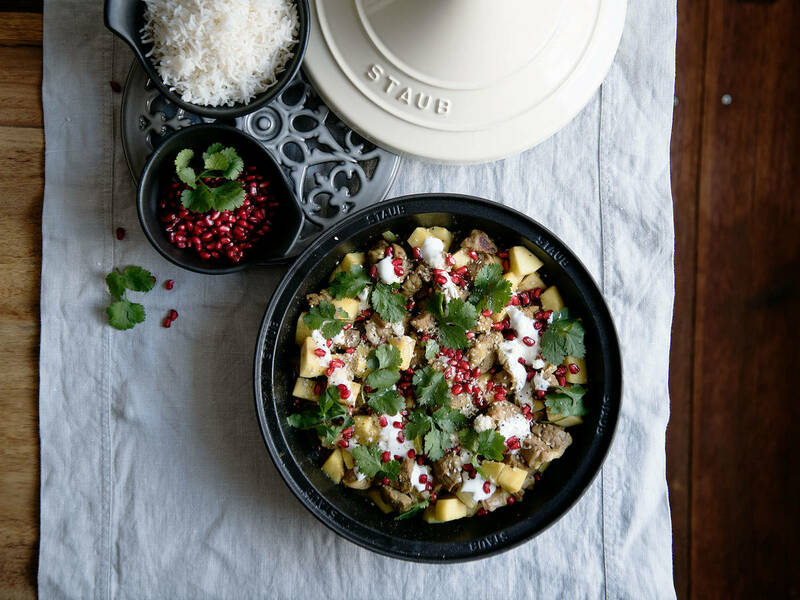 Garnish with cilantro and pomegranate seeds. Enjoy with rice!